If you want a seasoned faculty member to be right beside you – giving you tips, tools, and techniques for being peacefully and predictably productive – then this step-by-step guide is for you! If you want to access ideas at your own pace throughout the year – then this step-by-step guide is for you! If you want mindsets and strategies to support you in your office, your classroom, and your academic life, then this step-by-step guide is for you! 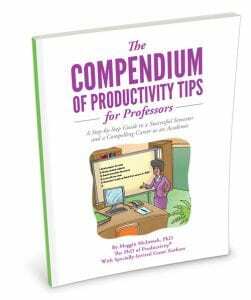 Meggin McIntosh, along with a select team of contributors, has created an academic productivity manual especially for college and university faculty. It is immediately downloadable so you may get started today. Just like with any book, you may use the Table of Contents, find the topic you want some help with and then choose one tip – and you will experience a difference. Or, you could print out one of the sets of tips to post near your desk or to take with you to the classroom and use the handy reference to support you in the changes you want to make. Nearly 200 tips to support you in your various roles as an academic, including dealing with perfectionism, traveling to conferences, dealing with deadlines, building relationships, and so much more. 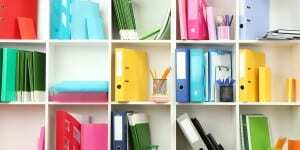 You WILL be more peacefully and predictably productive as soon as you start putting one or 10, 20, 100 or more of the Productivity Tips for Professors in place. Learn ideas that will serve you professionally – and personally. To create and sustain an academic life that is peaceful, predictable, and productive, get your copy now.